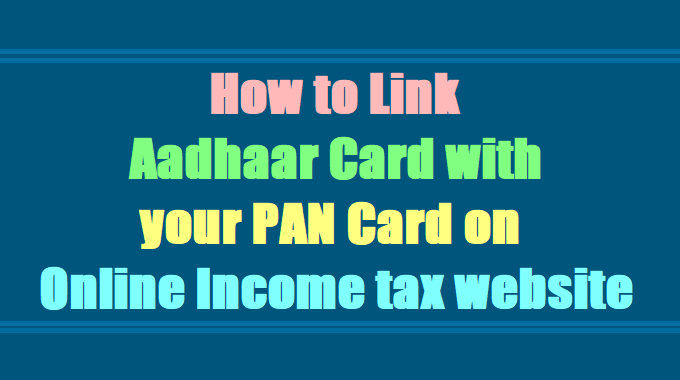 Income Tax Department simplifies linking PAN with Aadhaar: The Income Tax Department has made it easy for taxpayers to link their PAN with Aadhaar. Responding to grievances of taxpayers regarding difficulties in linking PAN with Aadhaar their names did not match in both systems (Eg. Names with initials in one and expanded initials in another). the Department has come out with a simple solution now. Step 3: Enter the captcha code then press the link submit. Step 3: After verification from UIDAI, the linking will be confirmed. Aadhaar can also be seeded into the PAN database by quoting the biometrics-based identity number in the PAN application form - for allotment of a new PAN or for reprint of PAN card. In case of any minor mismatch in Aadhaar name provided by taxpayer when compared to the actual data in Aadhaar, One Time Password (Aadhaar OTP) will be sent to the mobile registered with Aadhaar. Taxpayers should ensure that the date of birth and gender in PAN and Aadhaar are exactly same. In a rare case where Aadhaar name is completely different from name in PAN, then the linking will fail and taxpayer will be prompted to change the name in either Aadhaar or in PAN database. There is no need to login or be registered on E-filing website. This facility can be used by anyone to link their Aadhaar with PAN. This facility is also available after login on the e-filing website under Profile settings and choose Aadhaar linking. The details as per PAN will be pre-populated. Enter Aadhaar no. and ENTER NAME EXACTLY AS GIVEN IN AADHAAR CARD (avoid spelling mistakes) and submit. Taxpayers are requested to use the simplified process to complete the linking of Aadhaar with PAN immediately. This will be useful for E-Verification of Income Tax returns using OTP sent to their mobile registered with Aadhaar. Please ensure the Date of Birth,Gender and Aadhaar Number is as per Aadhaar details to proceed further. If date of Birth and Gender is fully matched and Name as per Aadhaar is not exactly matched then the user has to additionally provide Aadhaar OTP to proceed with partial name match.